I cried the day the Yankees traded for Alex Rodriguez. In February of 2004, I was seven years old and the biggest Alfonso Soriano fan on the planet. I had his jerseys and his baseball cards. I knew all his stats and his biography. I probably knew more about Soriano than Alfonso himself. So when he was traded for A-Rod, I was obviously devastated. I still remember that morning. I got up and my parents broke the news to me; it was like they were telling me a relative had passed away. I cried and cried and cried. I didn’t care that A-Rod was the best player in baseball, I was just devastated that I wasn’t going to be able to watch Alfonso Soriano play baseball for the Yankees anymore. Twelve and a half years later, I feel the same way about Alex Rodriguez. I didn’t cry when I found out A-Rod was retiring/being released (would’ve been pretty pathetic considering I’m 20), but I just felt devastated. Somewhere along the way between those two days of devastation, A-Rod became my favorite baseball player ever, Alfonso Soriano included. Alex Rodriguez will likely go down as the most infamous, controversial, and polarizing baseball player of all time. Nobody has ever had his mix of success, failure, drama, and entertainment in the history baseball, and maybe even sports. Love him or hate him, A-Rod has been baseball’s most intriguing character for over two decades, and the game won’t be the same without him. A-Rod’s story is one we all know, but one that bears repeating because of how entertaining and hard to believe it really is. He was the Dominican kid out of Miami who became a prodigy in Seattle. As the first overall pick of the 1993 draft, expectations were high, but Rodriguez didn’t disappoint. He made his MLB debut at 18 years old and was outstanding in his seven years in Seattle. The first time A-Rod sniffed controversy was when he signed his 10 year, $252 million deal with the Texas Rangers before the 2001 season. He was still clean, but success attracts criticism. Some chastised A-Rod for “chasing the money,” leaving Seattle, and going to a non-contender. A-Rod became the posterboy for overpaid athletes and the target of anyone who thought that the amount of money in sports was out of control. He continued to destroy baseballs during his time in Texas. He averaged 52 home runs between 2001 and 2003, leading the league in homers all three of those seasons, and winning his first MVP award in 2003. He was on PEDs at the time, but nobody knew that then. A-Rod was still just a great baseball player. He was clean in a dirty game. He was going to be the hero that took back the home run records from the cheaters who stole it. Then came the Yankee years. A-Rod may have started with Seattle and had his best statistical years in Texas, but Alex Rodriguez will always be remembered as a New York Yankee. It was the trade that devastated me and shocked the baseball world. A-Rod was supposed to go to Boston, but after Aaron Boone injured himself playing basketball, the Yankees needed a third baseman. The rest is history. A-Rod came to New York with skeptics waiting. How would he handle switching to third to accommodate Jeter (who was a worse defensive shortstop)? How will he handle going to Derek’s team? How will they get along after A-Rod’s disparaging comments made about Jeter a few years prior? Would A-Rod ever be a “true Yankee”? From 2004 through 2008, A-Rod was a sportswriter’s dream. Personally, I think those five seasons are the most “A-Rod” of all. He was insanely productive, first of all. He had at least 35 homers and 103 RBIs in each of those seasons and was about a .300 hitter. He won two MVPs, led the league in home runs twice, and had a 54 home run and 156 RBIs season mixed in there. Going strictly off numbers, A-Rod was about as close to perfect as you could get over those five seasons. However, everyone knows that A-Rod is the personification of imperfection. While he was producing at ridiculous rates during those years, he was also making headlines for the wrong reasons. In 2004, there was the fight with Jason Varitek and slapping the ball out of Bronson Arroyo’s glove during their ALCS collapse. Off the field, he was making headlines for his alleged affairs with Madonna and strippers while going through a public divorce with his wife, Cynthia. Who can forget the thousands of blonde masks at Fenway Park? There was also him yelling “I got it” while running the bases trying to distract fielders on a pop up in Toronto. The other infamous pop up was when A-Rod was in the field. 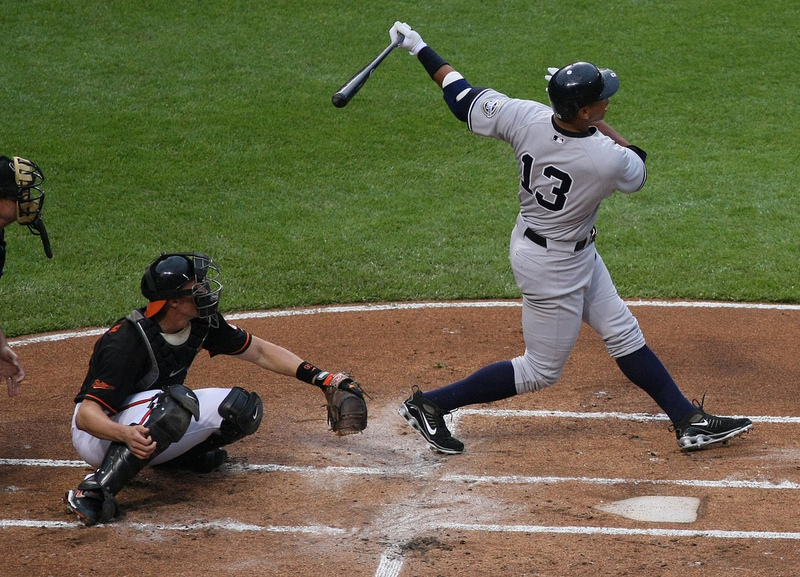 The strained relationship between him and Derek Jeter seemed to reach a boiling point when they collided and allowed a pop-up to drop between them in an August 2006 game. Then there were the bizarre pictures. It was during this time that he apparently had a variety of weird photographs taken of him. There was him kissing mirrors, tanning shirtless in Central Park, and strangest of all, as a centaur. His struggles weren’t just off the field. As good as he was in the regular season, A-Rod struggled mightily in the playoffs early in his Yankee career. The Yankees went out in the ALDS three straight seasons from 2005 to 2007. A-Rod went 7-44 in those three playoff series. It was so bad that Joe Torre batted A-Rod eight in one game during the 2006 ALDS against the Tigers. While Jeter was Captain Clutch, A-Rod was the choke artist. In 2007, A-Rod made headlines during the World Series, but for the wrong reasons. During Game 4 of the Red Sox-Rockies World Series, Rodriguez decided it was a good time to announce he was opting out of his contract. He would of course return on the record 10 year, $275 million deal he’s still on. So as entertaining and weird 2004-2008 were for A-Rod, 2009 is probably the most important year of his career, for better and worse. No year had a bigger impact on his legacy, both positively and negatively. The year started off as a nightmare for Rodriguez. In February of 2009, a report surfaced that A-Rod had failed an anonymous PED test in 2003. There were rumors before, mainly coming from Jose Canseco, that A-Rod had juiced, but this was the confirmation. He admitted to using PEDS from 2001-2003, and blamed the “loosey goosey” attitude of baseball back then, saying he was young, naive, and stupid. This also gave us the most famous cousin in baseball history, Yuri Sucart. All in all, he actually handled the situation pretty well, especially by his standards, but the damage had been done. The dreams of A-Rod being the white knight to take back Barry Bonds’ tainted home run record were no more. A-Rod was as much a cheater as the rest of them. Despite the rough start to the year, 2009 still was a positive year for A-Rod. He returned from a hip injury in style. On May 8th in Baltimore, A-Rod hit a three-run homer on his first pitch back in action; he’s always had a flare for the dramatic. He had a very productive year overall, hitting two homers and driving in seven runs in one inning on the final day of the season to reach the 30 home run/100 RBIs plateau for a 12th straight year. However, 2009 stands out for A-Rod because of his postseason performance. After years of playoff misery, he got the playoff monkey off his back and instead put the team on his back en route to his first and only championship. In 15 playoff games, he hit .365 with six homers and 18 RBIs. He had huge hits and homers along the way. For all the hate he gets, the Yankees don’t win that 2009 World Series without A-Rod, like Brian Cashman said in Sunday’s press conference, and you can’t take that away from him. The 2010-2012 seasons were pretty boring by A-Rod standards. He was declining in production and battling injuries. Over those three seasons, he averaged 119 games, 21 home runs, 81 RBIs, and hit .272. The 2010 season was clearly the best of the three; he had 30 homers and 125 RBIs in 137 games. Overall, though, there was nothing too interesting happening, it was just clear that A-Rod was entering the twilight stages of his career. The end of the 2012 season is when things began to go awry. He went just 3-25 in the playoffs and was pinch-hit for or sat multiple times. It was during Game 1 of the ALCS that he was supposedly flirting with two women in the stands, throwing them balls to exchange phone numbers. It was classic A-Rod. Then early 2013 is when the trouble really started for A-Rod. This is when he had his hip surgery and also became the prime person of interest in Anthony Bosch's Biogenesis scandal. There’s no need to rehash everything about this saga for A-Rod, but we know the highlights. There was Brian Cashman telling A-Rod to close his mouth, although in more harsh terms. There were rumors he’d never play baseball again and just collect his insurance money, claiming he wasn’t medically cleared to perform. It was just a weird year for A-Rod. It also gave us the most A-Rod thing ever. On August 5th, he returned from his hip surgery to play his first game of the year, hours after he was handed a record 211-game suspension for his role in the Biogenesis scandal. It’s so A-Rod it hurts. Three years later, I still can’t believe those things happened on the same day. A-Rod’s flare for the dramatic is truly unmatched. The other moment we witnessed that season was the Ryan Dempster game. Dempster decided to play hero and throw at A-Rod for four pitches. Joe Girardi came out screaming in defense of his player, something that wasn’t lost on Rodriguez. He homered later in the game off Dempster, again proving that you just shouldn’t take your eyes off the man. Then 2014 was a lost, ugly year for Rodriguez. His suspension was reduced to 162 games, but A-Rod kept fighting. He pretty much just sued everybody: baseball, the Yankees, the players union. It was truly A-Rod against the world. I think this will go down as the ugliest part of A-Rod’s career. It’s hard to defend his actions, even for me. All I can say is I think he was misguided, getting some really bad advice, and that he did eventually seem to realize his mistakes and apologize, which does count for something. It was during his 2014 suspension that A-Rod seemed to truly change for the better. He kept quiet all year and stayed away from controversy, unprecedented for him. He spent time with his family, went back to school, and worked on both his mental and physical health. I think in a way his 2014 suspension was a blessing in disguise. It’s clear that A-Rod returned in 2015 as a changed man. The year off obviously physically helped him as a 39-year-old, but it made an even bigger impact on him as a person. In many ways, you can make the argument that 2015 was the best year of A-Rod’s career. It wasn’t his best statistically, but it was truly a special season. He was able to come back after missing a full year and be a productive player at 40-years-old. He slashed .250/.356/.486 with 33 homers and 86 RBIs. A-Rod was once again a feared hitter, and the Yankees wouldn’t have made the playoffs without him. More importantly, he said and did all the right things. A-Rod couldn’t get out of his own way for the vast majority of his career, but that changed last season. It’s why I think A-Rod really did change last year. There’s no way the A-Rod of old could have put on that charade for an entire year without breaking character once. He seemed authentically remorseful for his mistakes and genuinely appreciative of the opportunity to play baseball again. Let’s also not forget that in October he proved he has a future career in sports broadcasting. Yankee fans’ opinions and many baseball fans’ opinions of A-Rod did a complete 180 in one year. Then this year happened. A-Rod continues to be fine off the field, but he just hasn’t performed. He hasn’t hit for average, he hasn’t hit for power, he’s striking out, and he’s barely drawing walks. All good things must come to end; he is 41 afterall. Looking back on that summary of his 22-year career leaves a lot of “What if?” questions. In many ways, we may look back on the A-Rod career as the “What if?” career. What if he never signed with Texas? What if he did get traded to Boston? What if Aaron Boone never played basketball that day? What if A-Rod never used PEDs during his time in Texas? What if he never had his hip injuries? What if he never again used PEDS in the Biogenesis scandal? The list goes on. At the end of the day, you can say a lot of things about Alex Rodriguez. Kind of weird? Yes. Misguided? Definitely. Confusing? Without a doubt. Entertaining? Absolutely. I still don’t think you can say he’s a bad person though. Despite all the cheating and the lies, I still think A-Rod is good at heart. A-Rod has always just wanted to be liked. He’s had huge expectations bestowed upon him since he was 18 years old, that’s more than half his life. When you look at where it all went wrong with A-Rod, I think you can point to his obsession with wanting to please others and be accepted. The times he’s been caught with PED use (2001-2003, 2010-2012) came after he had signed huge, $250 million-plus contracts. I’m sure there were selfish reasons behind his cheating, but I truly (and maybe naively) believe he did it more to prove himself to others than anything else. Despite all his success, A-Rod has always seemed to have a lower self-esteem than you’d expect. You can spend an endless amount of time trying to break down his mind. Some say it all stems from growing up without a father, others say it’s growing up with the weight of the world on his shoulders, and others say he’s basically just a headcase. I have no idea, but I do think he’s, at least currently, a pretty good guy. You hear it from his teammates, you see it when he talks about the game he loves and his daughters that he loves. There’s just always been something humanizing about A-Rod. Derek Jeter will go down with a better legacy and having meant more to the Yankee organization and their fans, rightfully so. However, I think Yankee fans, although they may not care to admit it, can relate to A-Rod more on a personal level. Jeter never failed. He was perfect. He had big hits, was spotless off the field, and beloved by all. A-Rod failed…. a lot. He made mistakes, and he learned from them, just like everyone else does. So while Jeter was the angel flying through the sky, A-Rod was, in his own words, “someone who tripped and fell a lot, but someone that kept getting up.'' A-Rod won’t have the same legacy as Jeter, but he’ll at least have that. A-Rod’s legacy is another hot topic of debate. He won’t get his number retired by the Yankees, and probably shouldn’t; I think that honor has been overdone. He should, however, definitely get a plaque in Monument Park. He’s one of the greatest Yankee hitters of all time, and they won a championship because of him. He at least deserves some acknowledgement. As for the Hall of Fame, it just won’t happen. If Bonds and Roger Clemens aren’t getting in, there’s no reason to believe that A-Rod will, but he absolutely should. The point of Cooperstown is to honor players who were dominant during their era and to tell the story of baseball. A-Rod was indisputably dominant during his era, even if it was the steroid era. His talent is undeniable. Look at what he did in Seattle and from 2004-2009 when he was (at least supposedly) clean. And I urge you to find a single person who thinks you can tell the story of baseball without telling the story of Alex Rodriguez. I don’t know where A-Rod goes from here. Hopefully he just walks away quietly and becomes a special advisor to the Yankees. There’s no point in him chasing 700 home runs. It’s a meaningless milestone that won’t help his legacy. Ending his career as a Yankee, staying true to his word, and walking away now when the time is right will help it. I realize how incredibly (and maybe unnecessarily) long this piece on A-Rod was, but this is possibly the last time I can ever write about him, and A-Rod has meant a lot to me on a personal level. In a weird and delusional way, I’ve always felt somehow connected to A-Rod. He was the guy the Yankees traded my (then) favorite player ever for. He’s the guy I met on a San Francisco street corner who told me he couldn’t sign an autograph because he was with his wife and daughter, which I understood. When I did chores as a kid, I wasn’t paid in a normal allowance. Instead, I had an “A-Rod envelope.” My dad would give me a dollar every time he hit a home run, and $20 if it was a grand slam. That day in 2009 when he returned and hit a home run on his first pitch also happened to be the day of my 13th birthday party. He’s also the player that led the Yankees to the only World Series I’ve been able to witness as a cognizant fan. A year later, he hit a homer on the day my grandma passed away, a die-hard Yankee fan who HATED Alex Rodriguez. I still wore my #13 jersey throughout all the Biogenesis drama and never stopped being an A-Rod fan. I gave him a standing ovation every time he came to the plate in 2013 and on Opening Day of 2015. Then, this past Sunday, I had the opportunity to cover my first Yankee game for WFUV. I had no idea at the time I said I could cover it that it would be the same day A-Rod announces his retirement. It could all just be a coincidence, but I’m crazy and delusional enough to believe me and A-Rod are like kindred spirits in some way. I’m pretty sick; I know. A-Rod gave me a childhood full of baseball memories and for that, I’ll always be grateful. It’s going to be weird not watching his sweet swing anymore after this Friday.